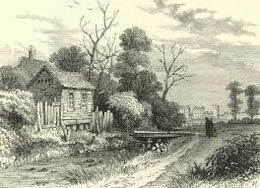 Rising on Hampstead Heath and entering the Thames at Blackfriars, the River Fleet flowed immediately to the west of the City of London and as such formed both an extra defence and the site of early settlement beyond the walls. On this walk we follow the course of the river upstream from its mouth, noting from the the clues in street names where it flowed and the activities of those who lived on its banks. We will pass the palaces, prisons, churches, market and priories which were built on its banks. Why can we no longer see the river? Charting its early story upstream as far as Clerkenwell, by the time we return to the Fleet’s mouth at Blackfriars, you will understand only too well! I shall be leading this walk on Saturday March 11th 2017. Meet outside Blackfriars Underground station, 10.45am.